The 5 Year Celebration of Great Eastern Cutlery has come and with that more and more interest ...............so I thought it appropriate to look at all those other knives that have been produced for Private Individuals, Cutlery Companies, Retailer Private Label, Distributors ( Special Factory Orders ) and Knife Makers. And these two ""Beauties"" from 2010 !!!!!!!!!!!!!!!!!!! along with my,2008 Bexley Pen & Knife Set !!!!!!!!!!!!!!!! Its cool to see all of these in one spot, nice thread boggs!! Fantastic knives being shown WOW!! Oh there's more.....thanks gang for posting...and I'll have more to fill in tomorrow .. Very nice... ...didn't know they turned out that many private label knives. 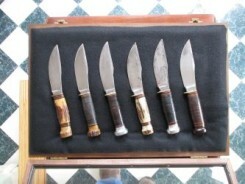 Collectorknives.net Conductors with coping blade secondaries. Northfield trim without bails.